Our Espresso Turbo Martini was created and tested by Grace and Pete who were looking to put a twist on the original Espresso Martini. Want to know how to make an espresso martini with a twist? Then read on. Salted Caramel Vodka – home made if you fancy, find out here how to make salted caramel vodka. Coffee Liqueur – you can make this too, read our recipe for homemade coffee liqueur. A cocktail shaker. strainer, martini glasses and some coffee beans. Here we go - let's get our groove on! Firstly, pop lots of ice into a martini glass and add 25ml of strong, hot espresso. Next, collide your two mixtures (coffee and alcohol) into your shaker, including the ice. Serve through a strainer and add three coffee beans on top. For the extra special touch, coat these coffee beans in chocolate earlier in the day and refrigerate until required. And voila! You have just made our turbo martini. An espresso martini with a twist. 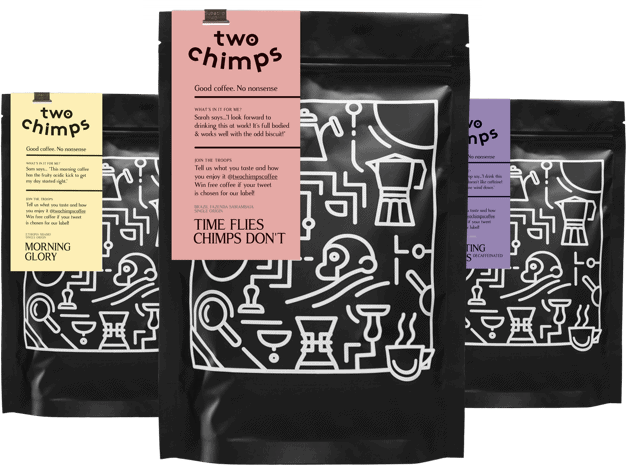 Head over to our online coffee shop to stock up on Two Chimps Coffee so you can make more.